Support comes from the lovely Kate Wilkins. I last played with Kate at The Kate Kate Kate Kate show curated by Abie Budgen back in October 2014. Here’s a little video of our finale that night Singing! Gig starts 8.30pm and it’s a mere £4 in – cheaper than a Travel WM Daysaver! I’m just learning a few harmonies to sing with the lovely Kirsty McGee at The Kitchen Garden Cafe this Wednesday 2nd October 2013. It should be a good’un, 7.30pm doors, 8pm music. My apologies that it’s been a while since the last update. Saturday August 31st – Wallingford Bunkfest, (Solo set; 4.30pm at the Portcullis Club. See www.bunkfest.co.uk for more details. 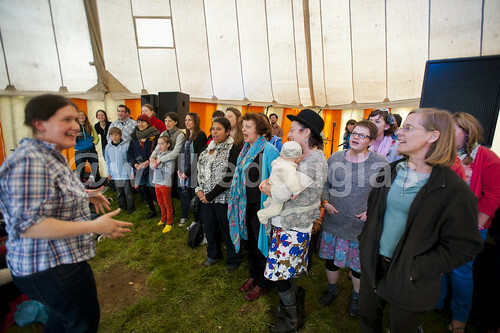 I’ll also be leading a singing workshop from 10:00 – 11:30 at Centre 70, Wallingford. Details here. Yes – I only have one shirt! I had knee surgery 7 weeks ago which has meant that I’ve (a) had a bit of time of my hands and (b) not been able to get out much. One good thing from this situation has been that I’ve had time to record a few demos for the new record (due out late 2013). I’m hoping that this new album will have a more americana, motown, country, secular gospel feel to it than previous recording but that remains to be seen/heard. So, while I get it together, here’s a second taste of the new album in video form: imagine, if you will, 3-part harmonies, slide guitar, double bass, glockenspiel, cajon and shaky eggs… [for lyrics, see here]. Thanks for listening.